Blog posts are the work of individual contributors, reflecting their thoughts, opinions and research. In early June, 2014, a home in the East End of Vancouver was raided by the Vancouver Police Department on a warrant listing graffiti paraphernalia as it’s purpose. The home is inhabited by several Indigenous and non-indigneous anarchists who have worked organizing efforts to stop the Kinder Morgan and Enbridge pipelines running from the Tar Sands in Alberta to the coast of British Colombia, and through several Indigenous territories. This artilce discusses the raid, some social movement etiquitte around public statments and internal debate vs. public infighting, and a bit of context around graffiti as a disticnt and pre-existing social movement itself. The VPD’s raid was part of an investigation that is predicated on one resident’s alleged involvement in acts of graffiti/vandalism. An arrest was made on 6 counts of mischief, all occupants of the house were engaged at gun point by the police, detained briefly and barred from their home for the day. Items of all residents, regardless of their association/non-association with the warrant were taken into custody; including cell phones and computers. All charges were dropped at the end of the day, and the arrestee was released without conditions or a further court appearance. Thus, at this point, while the police have initiated an investigation, there is no connection between members of this household and criminal activity: no charges have even been laid. Many people with experience in political organizing recognize the raid as a ‘fishing’ operation the police used as a pretext to gain access to private communications in the memories of the cell phones and computers, as an act of aggression and intimidation, and as an opportunity to foment conflict amongst different sectors of the anti-pipeline movement. It is my understanding that no specific acts of graffiti/vandalism were cited by police nor on the warrant. Any identification towards what graffiti is referred to is speculation based on zero evidence thus far. Although the residents of the home seem to have stated their belief that the investigation, raid, and arrest were in reference to anti-pipeline graffiti that reads, “No Pipelines”. There is no specific location of graffiti identified by the police. Yet, in the public discourse around it, a mural or perhaps two murals, have been identified as particularly irking places the “No Pipelines” tag has occurred. While public statements have been made around this, there is no evidence to direct the graffiti on the mural to the raid on the house. Meanwhile, these public statements directly implicate the residents of the home that was raided, and will likely negatively effect their defence against further legal persecution. An important note on the “No Pipelines” tag, it appears all over the city of Vancouver, where Kinder Morgan intends on expanding its existing pipeline terminal, transporting significantly more bitumen products from the Tar Sands, and dredging the Burrard inlet and greatly increasing oil shipping traffic. It is clear by the style of writing that this “No Pipelines” tag is somewhat of a graffiti meme, that is picked up and used by many different people. Whether a person thinks the graffiti on the mural is good or bad … anyone’s personal opinion on the murals has no legal relevance to the home raid that occurred, but when mainstream organizations and people in leadership positions make disparaging remarks directed at a person or people undergoing legal persecution, it does have legal bearing on the ability of already marginalized, grassroots community members’ capacity to defend themselves against a clearly over zealous and violent police force. While public discussion is valued by activists, it is important to differentiate between public discussion that increases connectivity and strengthens movements, and public infighting, set up by the state, that divides and weakens social movements. Sloppy, thoughtless, self serving, or malevolent usage of the media can damage social movements for seeming short term gains. But a further ethical, or social conflict is occurring in this issue around the “No Pipelines” tag, a conflict that surfaces when non-legal or non-sanctioned action is taken by some members of a social movement. In these cases, there is usually an assumption that the people on the side of the most mainstream should win by default, because they have the ‘the majority of people’, and those people don’t support those kinds of tactics, therefore the people doing the damage should stop, before they alienate, ‘the people who matter’. Obviously, ‘majority rules’ is a specious argument. But what about, “the people who matter”? Let’s unpack that for a moment: in this case, the matter at hand is graffiti. And the people who do graffiti are villainized and dehumanized in the argument –they have no rhyme or reason except to piss people off. The anti-graffiti argument demands that the graffitists listen to them, understand where they are coming from, and curtail their actions accordingly. Meanwhile, this same group of people will very likely not even consider that the people who do the graffiti, and the people who support the graffiti, have very sound and rational reasons for using graffiti as part of movement building. Graffiti is a form of communication used by youth, disenfranchised youth, who are alienated and often apathetic to participating in organizing for social change. So these kids really don’t matter. Graffiti is one of the only ways this group of youth has to communicate with themselves, and with the world. They have the internet, but in terms of real world life, graffiti is a vital cultural feature of the urban youth landscape. Graffiti is a physical presence in a society that erases them out of existence. Urban youth are the people who’s future is the future that is at stake if these pipelines go through and the Tar Sands continues and capitalism destroys the entire biosphere in pursuit of endless profits. This is not hyperbole. This is the reality of the future young people face today: and poor young people are not participating en masse in movements for social and environmental change. Perhaps, one reason for that is that mainstream environmental groups ‘dispose’ of them as assholes, degenerates and criminals. These kids are not Environmental Youth Alliance heritage seed saving bee farming go getters. Youth roaming the streets at night are at risk of many dangers, and graffiti is one way to engage youth where they are at, in a way that is approachable and validating. It is my assessment that a young person roaming the city streets is far better off, and contributing a greater benefit to society, by spray painting politicized graffiti rather than getting wasted on drugs and alcohol to avoid having to face a very grim future. These young people matter. And to disparage them because they don’t have any power in society is a grievous ignominy to the people who have the least capacity to effect change, and the most to lose if it doesn’t happen. For all you ‘squares’ out there, let me turn you on to a bit of what’s the hizzle shizzle here. Eventually, some people, who were hip with the jive of the time suggested that maybe this youthful dedication and energy could be harnessed for good instead of evil. They began art programs and programs in schools and youth programs to focus the creative endeavours of these young writers towards the art world (without actually making any systemic changes to the poverty and alientation these kids faced in the first place...). Some writers did veer into the legitimate art world and hung their work in galleries and sold it for lots of money: while art dealers and speculators made even more money. Meanwhile, many writers stayed on the streets and resented the now ‘legal’ graffiti writers as sell outs and betrayers of the graffiti code. Another strategy to curtail graffiti was to employ artists to paint murals. This strategy, ironically, exploits a prime ethic in the graffiti code: don’t go over other writers’ pieces. Eventually, regular artists, as in non-street tested artists began to be employed to paint ‘anti-graffiti murals’. So the paradox here, is that city muralists only have jobs painting murals because of the social upheaval graffiti artists caused. Meanwhile, these muralists are betraying the graffiti code itself, by lending their art to the very establishment that represses graffiti, and often lands writers in jail and subect to other legal persecution, including massive surveillance operations (the cost and scope of which would lead many tax paying citizens to wonder “isn’t it cheaper and faster to just paint over the graffiti?”). 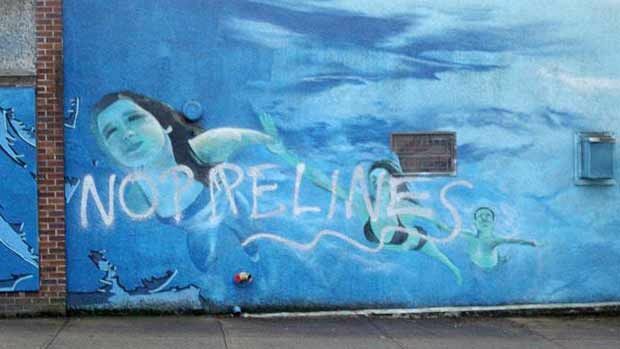 While the graffiti movement in Vancouver today is a far, far, far cry from the Bronx in the 1970’s, there is historical, and real, cultural relevance to what is going on with the “No Pipelines” tag and the kids swimming mural. This is called, “an intersection of social movements”. Graffiti is a 45 year old art/anti-art, social movement, and if anyone, ‘as an artist’ is going to speak on this matter, it seems apropos, to have some understanding of this rather long standing and persistent field of communication, some may call one of the longest running artistic movements of the contemporary era. thanks for an informative and insightful article. i'm curious how you would compare politicized graffiti such as the "no pipelines" message and the id/name tags that resemble a salad made with intestines. what message are the latter comunicating? they seem to me the human equivalent of dogs marking their territory, with more and larger and difficult placement of markings translating into status for the marker. we are all animals so it isnt negative to compare tagging to peeing on landmarks - it seems to serve similar basic needs. Most pop-culture is almost completely a-political and the majority of taggers are too. Although this article makes a great case that graffiti is inherently a socio-political phenomenon, you get plenty of mediocre crap for every person who actually has something to say. Also, the urban landscape is more "jarring" to me when the "business improvement associations" and the cops have finished sterilizing everything. Blech!